A Recipe is part of the item synthesis system in Kingdom Hearts II. Found scattered throughout the worlds, a recipe is a list of synthesis materials needed to make a particular item. Many of the most powerful items in the games, including Sora, Donald, and Goofy's ultimate weapons, have recipes that must be found before the opportunity to make them is unlocked. When a recipe is found, it is stored as a unique item, and is automatically given to the Moogle the next time the synthesis menu is opened at any Moogle shop. In Kingdom Hearts 358/2 Days, Recipes are regular synthesis panels, and are used to synthesize magic and item panels. In Kingdom Hearts Birth by Sleep, any command can be melded if the user has the right ingredients; however, Recipes allow the user to see what the outcome will be before the melding is performed. Higher level commands cannot be seen until the user has obtained higher level Recipes. In Kingdom Hearts 3D: Dream Drop Distance, Recipes can be used to create Spirit Dream Eaters as allies. Gādo Reshipi?) Defense Boost, Power Boost 100 Acre Wood, the Exposition Minigame in the Spooky Cave. Kingu Reshipi?) Save the King, Save the King+ Chest at the Ship Graveyard: Seadrift Row. Mūn Reshipi?) Moon Amulet, Star Charm Chest at the Restoration Site. Kuīn Reshipi?) Save the Queen, Save the Queen+ Chest at the Throne Room. Rikabā Reshipi?, lit. "Recover Recipe") Drive Recovery, High Drive Recovery Chest at the Mountain Trail. Sukiru Reshipi?) AP Boost, Magic Boost Hollow Bastion, second visit in Ansem's Study. Sutā Reshipi?) Elixir, Megalixir Disney Castle, in the Courtyard. Sutairu Reshipi?) Petite Ribbon, Ribbon Chest at the Starry Hill. Arutema Reshipi?, lit. "Ultima Recipe") Ultima Weapon Chest at the Mansion: Basement Corridor. Rea Dokyumento? )[KH II FM] Draw Ring, Lucky Ring Complete the "Duality" Puzzle in Jiminy's Journal. Kage no Shomotsu? )[KH II FM] Shadow Archive, Shadow Archive+ Defeat Zexion's Absent Silhouette. Himetaru Ikazuchi? )[KH II FM] Shock Charm, Shock Charm+ Defeat Larxene's Absent Silhouette. Chikara o Koeru Chikara? )[KH II FM] Centurion, Centurion+ Defeat Lexaeus's Absent Silhouette. Karenai Hana? )[KH II FM] Full Bloom, Full Bloom+ Defeat Marluxia's Absent Silhouette. Kyūmei no Michibiki? )[KH II FM] Frozen Pride, Frozen Pride+ Defeat Vexen's Absent Silhouette. Attack Recipe A list of recipes that result in basic attack commands. Terra: Chest at Tower Room. Meow Wow Recipe Meow Wow Sora: Speak to Neku in the Second District. 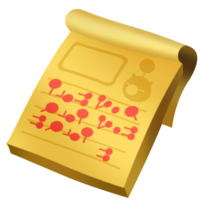 Tama Sheep Recipe Tama Sheep Riku: Clear third Special Portal in Traverse Town. Can be purchased from the Moogle Shop for 50 munny after reaching a Shop Level of 3. Yoggy Ram Riku: Chest in the Second District of Traverse Town. Komory Bat Riku: Speak to Joshua in the Second District. Pricklemane Can be purchased from the Moogle Shop for 50 munny. Hebby Repp Can be purchased from the Moogle Shop for 50 munny. Sir Kyroo Riku: Chest in the Gullet in Monstro. Toximander Sora: Chest in the Catacombs in La Cité des Cloches. Fin Fatale Can be purchased for 100 munny in the Moogle Shop after reaching a Shop Level of 2. Tatsu Steed Sora: Chest at Ocean Depths in Prankster's Paradise. Necho Cat Riku: Clear third special portal in La Cité des Cloches. Can be purchased from the Moogle Shop for 200 Munny after reaching a Shop Level of 4. Thunderaffe Sora: Clear fourth special portal in Traverse Town. Can be purchased at the Medal Shop for 280 Medals after reaching a Shop Level of 4. Kooma Panda Sora: Clear first special portal in Traverse Town. Can be purchased at the Medal Shop for 80 Medals. Pegaslick Sora: Clear first special portal in Symphony of Sorcery. Can be purchased at the Medal Shop for 330 Medals after reaching a Shop Level of 5. Iceguin Ace Sora: Clear first special portal in Prankster's Paradise. Can be purchased from the Moogle Shop for 200 Munny after reaching a Shop Level of 6. Peepsta Hoo Riku: Chest in Rectifier 1F in The Grid. Escarglow Can be purchased at the Moogle Shop for 100 Munny after reaching a Shop Level of 3. KO Kabuto Can be purchased at the Moogle Shop for 200 Munny after reaching a Shop Level of 4. Wheeflower Sora: Chest in the Town in La Cité des Cloches. Zolephant Sora: Rescue Quasimodo from the Nightmares at the Festival of Fools. Juggle Pup Riku: Clear third special portal in Prankster's Paradise. Can be purchased at the Medal Shop for 180 Medals after reaching a Shop Level of 2. Halbird Sora: Clear second special portal in Country of the Musketeers. Can be purchased from the Moogle Shop for 300 Munny after reaching a Shop Level of 7. Staggerceps Riku: Chest backstage in the Country of the Musketeers. Fishboné Can be purchased from the Moogle Shop for 100 Munny after reaching a Shop Level of 5. Flowbermeow Riku: Clear second special portal in Traverse Town. Cyber Yog Sora: Chest at Rectifier 2F in The Grid. Chef Kyroo Sora: Chest at the Dungeon in Country of the Musketeers. Lord Kyroo Sora and Riku: Defeat Lord Kyroo. Tatsu Blaze Can be purchased from the Moogle Shop for 100 Munny after reaching a Shop Level of 5. Electricorn Sora: Chest at the Fields in the Symphony of Sorcery. Woeflower Can be purchased from the Moogle Shop for 200 Munny after reaching a Shop Level of 3. Jestabocky Sora: Defeat the Nightmares after investigating the first Pinocchio sighting. Eaglider Sora: Chest at the Docks in The Grid. Me Me Bunny Can be purchased from the Moogle Shop for 100 Munny after reaching a Shop Level of 6. Drill Sye Sora: Clear second special portal in La Cité des Cloches. Can be purchased at the Medal Shop for 150 Medals. Tyranto Rex Sora: Protect Princess Minnie from the Tyranto Rex. Majik Lapin Can be purchased at the Medal Shop for 400 Medals after reaching a Shop Level of 6. Cera Terror Riku: Defeat the Cera Terror stampede summoned by the Spellican. Skelterwild Riku: Chest at the Verge of Chaos in Castle That Never Was. Ducky Goose Riku: Chest in the Machine Room in Country of the Musketeers. Aura Lion Riku: Clear first special portal in Country of the Musketeers. Can be purchased at the Moogle Shop for 500 Munny after reaching a Shop Level of 8. Ryu Dragon Riku: Chest at Golden Wood in Symphony of Sorcery. Drak Quack Sora: Chest at the Avenue to Dreams in The World That Never Was. Keeba Tiger Riku: Chest at Delusive Beginning in Castle That Never Was. Meowjesty Can be purchased at the Medal Shop for 2000 Medals after reaching Rank 20 in Flick Rush. Sudo Neku Can be purchased at the Medal Shop for 2000 Medals after reaching Rank 20 in Flick Rush. Ursa Circus Can be purchased at the Medal Shop for 2000 Medals after reaching Rank 20 in Flick Rush. ↑ 1.0 1.1 1.2 Can only be bought in the NA and PAL version.